Brave released version 0.55 on October 18, 2018. The new release represents a move away from its Muon version (Brave 0.25.2) to a Chromium version. The change, which brings a 22% increase in page load times compared to its Muon counterpart, allows Brave to leverage Chromium’s stability, and Google Chrome’s features and APIs. 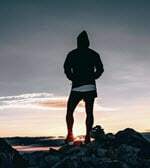 Along with the Chromium-based design change comes Brave Rewards (beta), a new system of compensating ad-blocked publishers and creators with Basic Attention Tokens (BAT) in place of what was Brave Payments. 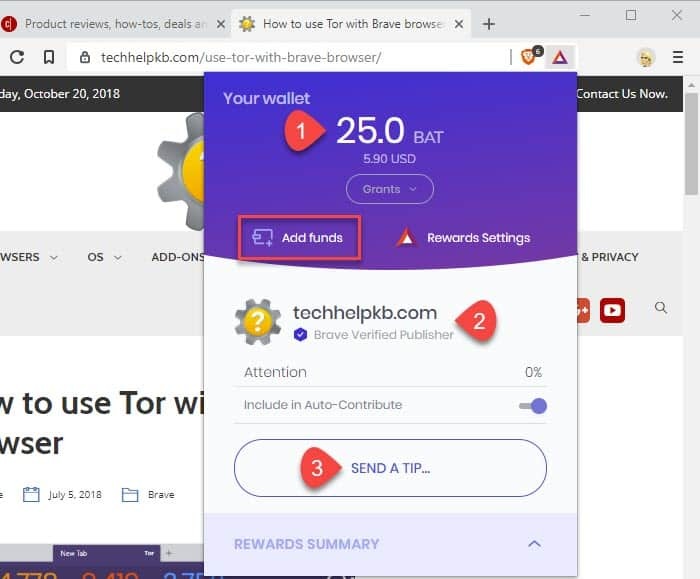 A component of Brave Rewards is the option to tip your favorite websites with BAT using Brave browser at the moment you visit them. Here’s how it works. To tip your favorite websites with BAT using Brave, users must make sure they are running the latest Brave version. To get started, launch Brave, visit brave://rewards/ and enable Brave Rewards. Brave may offer you a free grant of BAT when you install the browser or enable Brave Rewards. Be certain to accept the grant to add funds to your wallet right away. Click the Brave Rewards icon to launch Your wallet. 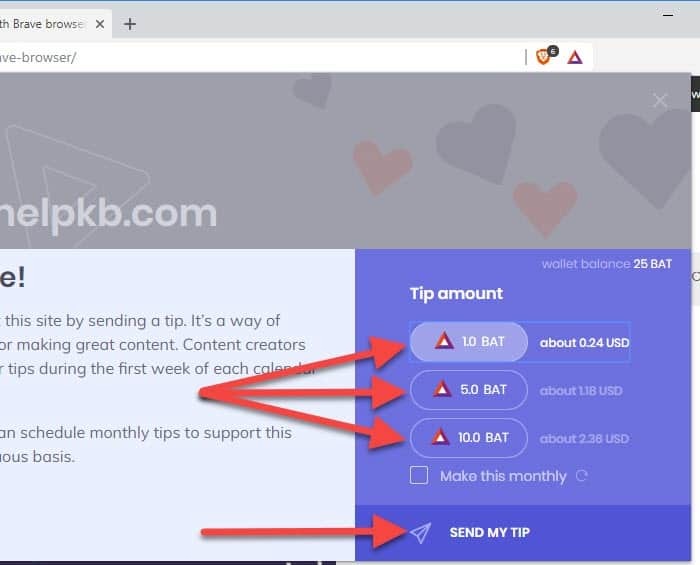 For tipping purposes, the wallet displays 1. your BAT balance, 2. the website you want to tip and whether the site is a Brave Verified Publisher, and 3. a SEND A TIP… button. 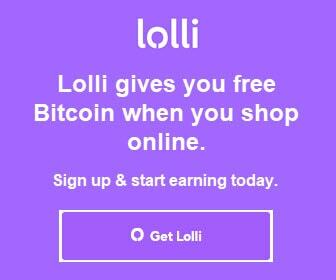 To add BAT to your wallet, click Add funds. Funding options include Bitcoin (BTC), Ethereum (ETH), Litecoin (LTC), and BAT, but credit card funding is in the works. To tip the website, click the SEND A TIP button. Select a tip amount — 1.0 BAT, 5.0 BAT, or 10.0 BAT — then click the SEND MY TIP button. To make the tip recurring each month, tick the Make this monthly check box. You will notice the BAT tip deducted from your wallet balance. Tips you send display in the Tips section of the Brave Rewards brave://rewards/ page. 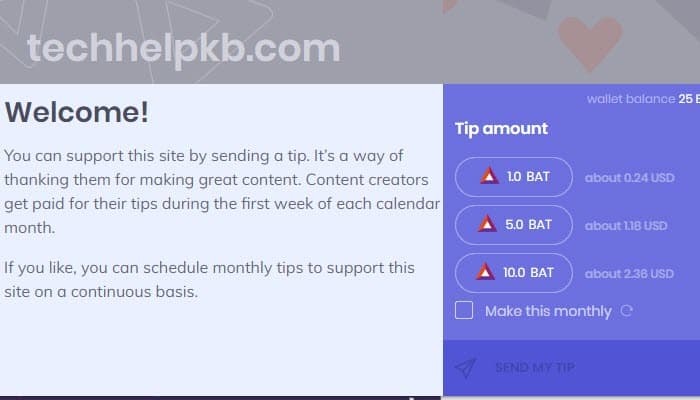 The BAT tips sent to content creators reach them in the first week of each new month. 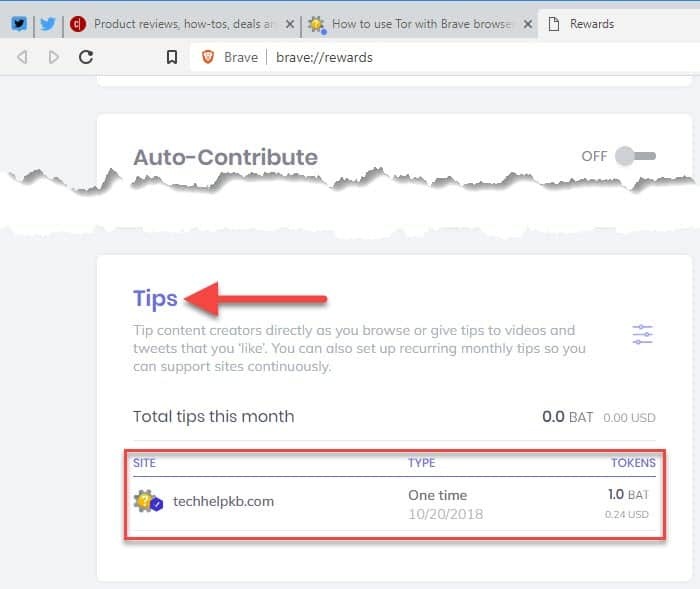 Thank you for visiting Tech Help Knowledgebase to learn how to tip your favorite websites with BAT using Brave browser. If you found this article helpful, consider sending us a BAT tip with Brave!